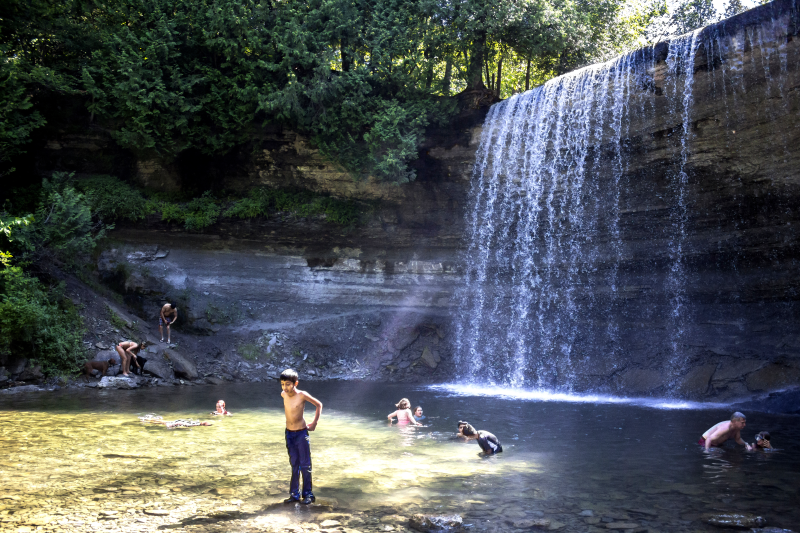 On a hot summer day, the cool water of Bridal Veil Falls in Kagawong, on Manitoulin Island, Northern Ontario, attracts visitors and locals of all ages. The shallow pool below the falls is perfect for a swim or a walk behind the falls on a rock ledge, a popular activity for those who stop here. Whenever I visit Manitoulin Island, where I once lived not far from this local treasure, I always make time to park along the highway and walk down the stairs that lead to the bottom. The Kagawong River runs away from the falls, a meandering, rocky stream through shaded woods, eventually spilling into Lake Huron at Mudge Bay. There is no more tranquil diversion on your travels than time spent in this secluded island setting, carved by time in the heart of Canada's natural world.